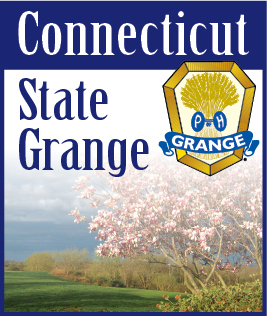 Fifteen Connecticut Grangers attended the 102nd Northeast Grange Lecturer’s Conference in Castleton, VT. This is the smallest group I have ever seen and yet only one State had more than us. My sincere thanks to everyone who helped in any way. Thank you to all who helped with program ideas and numbers; to those who made the nearly 400 mile round trip and took part in the program; and, to all who donated to the gift I was given on Spirit Night. You are all appreciated. Ask anyone that went and I am sure they will tell you that Connecticut had the most spirit, making the most noise. There has been discussions for quite some time regarding whether or not this conference will continue. There will not be a conference in 2018. This does not mean there will never be one again or that your State Lecturers have disbanded. We will be meeting in the spring to discuss further options and will also be putting together a book with program ideas. Previously you had to buy this book. Next year it will be given to all Lecturers (both Pomona & Subordinate) free of charge. My plan is to include it in the packet of information that is handed out at Let’s Celebrate in June. If you have any ideas on how to reorganize and improve on Lecturers’ conference please get them to me. I would like as much input from you as possible. I would like to hear from all members, not just Lecturers. By now you should have received your September-October Newsletter. The Honor Lecturer Report was included with this mailing. Please be sure your Grange fills one out. I don’t want to miss anyone who has been doing the projects in the Lecturers’ Department and sending in their reports. Your Grange should get the recognition it deserves. Enjoy the autumn months ahead. Hope to see you around the state and in Norwich at State Session.